Mooring chains secure floating structures in off-shore production of oil and gas. They can cause oil leaks if they fail and rupture the flexible pipes that bring the product to the surface which is a relatively common problem. 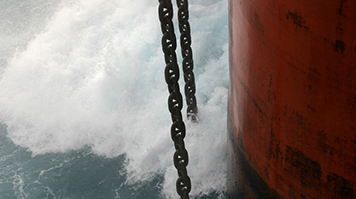 Chain failures result in 47% of offshore accidents worldwide, generating clean-up costs averaging £670 million a year. Regular inspection helps to reduce the levels of failure, allowing problems like corrosion, fatigue cracking and weld faults to be addressed before failure occurs. The RIMCAW project at London South Bank Innovation Centre aims to develop a compact, mobile Non Destructive Testing (NDT) robot, with advanced ultrasound sensors, that can climb on mooring chains both underwater and in air to scan chain links. The robotic NDT system will provide a tool to assess the condition of mooring chains, enabling asset managers to make decisions about repairs and to more accurately predict chain lifetime. It will also reduce inspection costs by speeding up coverage of a mooring chain and remove the need for diver inspection. Develop a novel inspection and commercially competitive tool RIMCAW for in-situ assessment of the condition of mooring chains. Develop a remotely operated and semi-autonomous robot, that treats the chain links as parallel rail tracks and uses wheeled motion and permanent magnet adhesion to rapidly climb the chain in both water and in air. Deploy phased-array ultrasound with a robot scanning arm to test the critical parts at the crown of each link. Meet fast emerging technology requirements for NDT that minimises human intervention; enables more preventive maintenance and continuous monitoring of moorings. Reduce environmental impact and improved safety of offshore production. Improve profitability of operators by reducing production losses from mooring failure, reducing leaks and downtime, enabling monitoring of service providers to deliver new services for more cost-effective asset management. Impact health and safety by meeting the EU Safety of Offshore Oil and Gas Operations directive that requires improvement of safety and reliability of moorings and risers in off-shore installations. Eliminate loss of lives and injuries to divers.